Abstract: Canton Fair, officially named as China Import and Export Fair, is praised as the international trade show with the longest history, the highest level, the largest scale, the most complete exhibit variety, the broadest distribution of overseas buyers and the greatest business turnover in China. Airwheel, specializing in self-balancing electric scooter enjoys a deserved reputation global wide. It is set to display its new products on the Canton Fair. It is said that Canton Fair, firstly held in 1957 is the showcase of China's opening up. Now, it has developed into an international trade show with the most complete exhibit variety, the broadest distribution of overseas buyers and the greatest business turnover in China. Last month, five brand new products, namely Airwheel S9 wheeled mobile robot, C3, C5 intelligent helmets for road safety and S8 sitting-posture electric scooter and Z5 electric standing scooter, which were rolled out on the CeBIT, held in Germany are believed to give people more choices and arise the masses’ environment protection awareness in the riding process. To Airwheel, the Asia is a potential and promising market where it is densely populated and faced with increasingly serious environment pollution. To attend this Canton Fair, for one thing is to enhance its global invisibility. 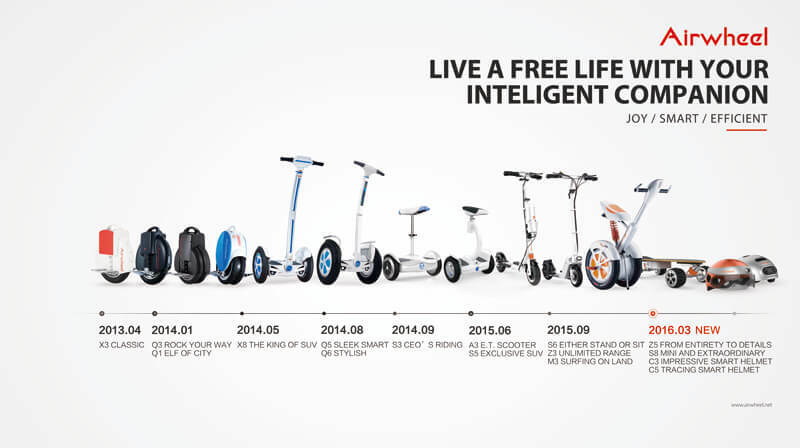 And more importantly, Airwheel intelligent electric scooter shoulders the responsibility to provide the public with environment-friendly and efficient trip modes. Of late, the artificial intelligence predominates the electronics market and the Airwheel S9 is more than a self-balancing two wheels scooter. To be more exact, it is a scalable robot base. In other words, the functions can be enriched with the prospective plug-ins or software upgrade. Besides the function of protection, Airwheel C3 and C5 aims to realize a relaxed and entertainment riding experience by virtue of the built-in Bluetooth and action camera. While Airwheel S8 and Z5 lay emphasis on the single details both in internality and in externality.